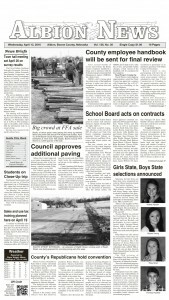 Albion sales tax receipts chart. Final figures on Albion city sales tax receipts for the 2015-16 fiscal year are in, and another record was set. 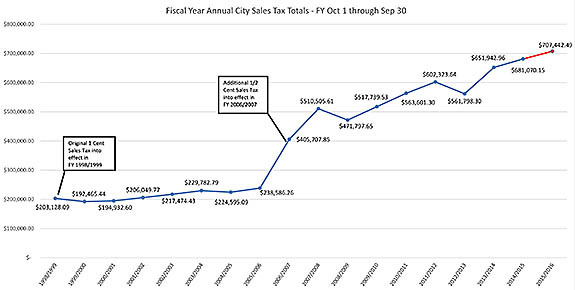 Total city sales tax receipts for 2015-16 were $707,442, an increase of 3.9 percent or $26,372 from the previous fiscal year’s total of $681,070. In July 2016, the final month of the fiscal year, city sales tax receipts totaled $58,606, only $196 more than the July 2015 total of $58,410. Receipts were higher in nine of the 12 months, and lower in three. The largest monthly gain came in September 2015, when receipts were more than $10,000 higher than the previous fiscal year. Motor vehicle sales taxes posted a big gain in July, reaching $4,009 for the month, up 63 percent from the previous month.